AdjunctHulk: HULK SMASH SIX PAIRS OF NEW PURPLE PANTS AND SIX WHITE OXFORD SHIRTS INTO SUITCASE FOR #MLA11. HULK IS GONNA LOOK GOOOOOOOOOD!!!! SampleReality: #MLA11 Tip: There are many ways to say “Your work is interesting, but let me tell you about MINE.” But it’s best to say it just like that. Prof Syn: Tip 8 (the last): Never ever picture the members of an interview committee in their underwear. The horror. Hmmmm … I can’t wait for AdjunctHulk to break out of Bill Bixby mode and go all Lou Ferrigno on #mla11. 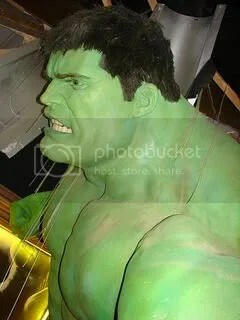 Image from Madame Tussauds, London, by Nevit Dilman from Wikimedia Commons under a Creative Commons license. Subscribe to comments with RSS	or TrackBack to 'Just Like “Texts From Last Night,” but Greener and With a PhD'. Nice roundup! As a former comedy scholar, I think that relieving tension is a very worthy contribution indeed, and these are great!